What constitutes a ‘good’ book is ornery. There are so ways to argue it, none less valid than the next. It’s why I hesitate when recommending books to others, because the same book can be many things to people. It holds some truth, I think; sometimes a book is really good, and sometimes it really is about timing. Many of my ‘good’ books are Star Trek books. In hindsight, I can’t quite understand why, since some of them weren’t actually any good. I discovered Star Trek at a near-perfect confluence of its availability in Singapore. Star Trek: The Next Generation was on cable after school (ST: Voyager would follow, a year or two later) and we finally had broadband. Most importantly, I was surrounded by bookstores that had an alarming number of Star Trek books. The well-worn Pocket Books paperbacks from the secondhand bookstore shared pride of shelf space with the shiny new releases from the now-defunct Borders at Wheelock Place. 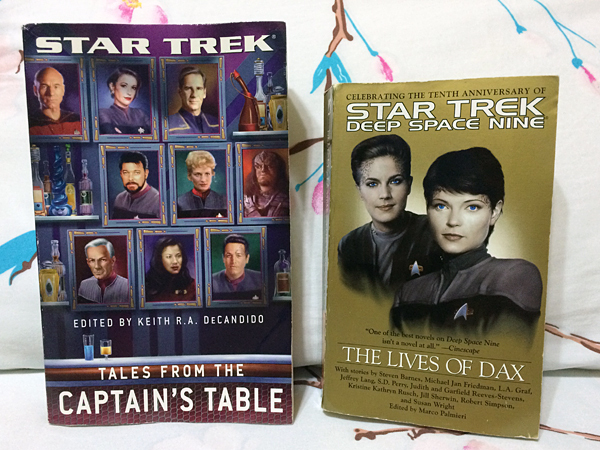 It was at Borders that I stumbled upon Tales from the Captain’s Table and The Lives of Dax. If Star Trek had been an eye-opener, these were the books that stopped my eyes from ever closing again. Here were short stories that delved into the possibilities of ST beyond its main series. We’d use the term expanded universe now, but I didn’t have that word back then. All I knew was that it was amazing. As much as I loved Picard, a bald middle-aged white man wasn’t the fictional self that this particular 9-year-old Asian girl was looking for. But in Captain’s Table and Dax, for the first time in the Star Trek universe, perhaps even for the first time in my entire short life, I saw women protagonists in the spotlight, exploring the universe and coming across conflict from human and alien alike. And in them, I saw myself. I saw that I could do anything, that I had a place in this amazing future. That’s a powerful thing to discover, when you’re 9 years old. It’s why we still need diverse books. It’s a belief that I’ve always held, even if I still don’t know how to articulate it or how to un-learn my privilege. I lost these two books over the years; perhaps lost in a move or accidentally donated. But over the last decade and a half, I’ve never forgotten about them. I’d underestimated their impact on my younger self. I would always regret losing them. By the time I was old enough to afford online bookstores, they had long gone out of print. When I could find them, they were far too expensive. I was bereft. Perhaps it just wasn’t meant to be. But one late night a few weeks ago, I found myself staring at Better World Books and their impressive selection of old, affordable books. And there they were. Condition: Used Good. At a price within reach. 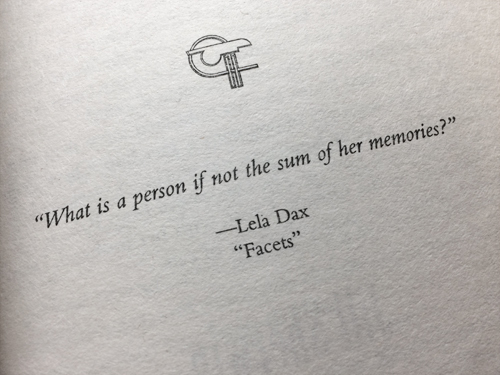 It’s entirely possible that I’m in love with the memory of these books and not the actual stories in them. I’m entirely prepared that they aren’t as good as I make them out to be. But that’s okay. Maybe most of what makes a book good, is that we’re reading it at the right moment in our lives. That right moment might be when you’re 9 or 25. It might be when you’re looking for reassurance that you’re more than just a single cog in a very big machine. The right book, at the right moment, might remind you that people like you can be the hero of a story that’s bigger than you. 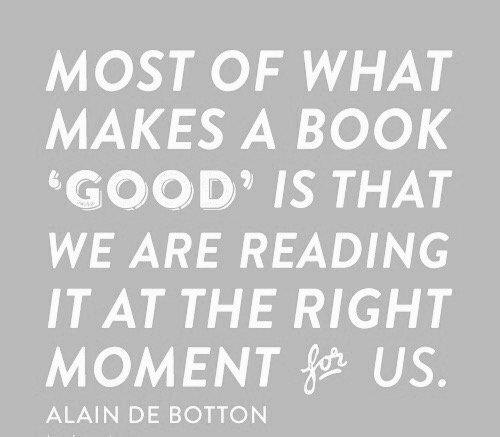 Maybe that’s what makes a book ‘good’. I had two great obsessions as a child: Star Trek and Victorian England. I think some of that carried over to my adulthood love of all things postal, particularly British postal history. I was lucky enough to see a Olympic gold postbox in Cardiff, a Victorian era wall box in Oxford, and even the very last remaining Liverpool Special! 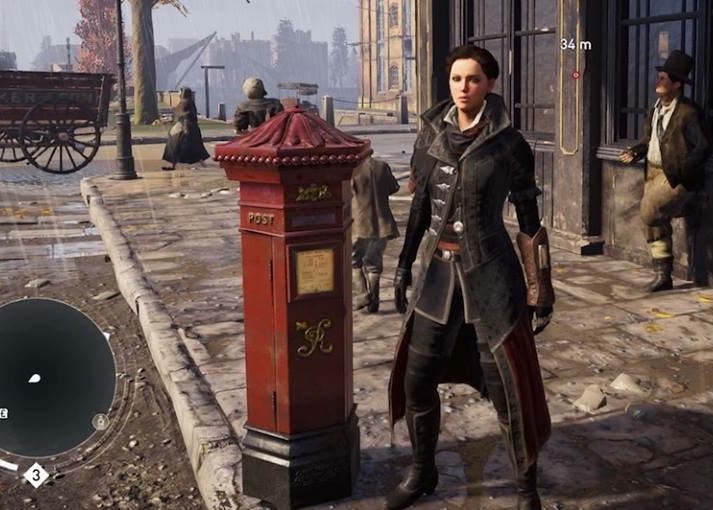 I also play a lot of video games, so I was excited when I found out that Assassin’s Creed Syndicate was set in Victorian London. When I fired up the game, I was blown away by how beautiful it is. London of 1868 Syndicate is absolutely gorgeous. So I pulled out my favourite history book of letter boxes, Old Letter Boxes by Martin Robinson (WorldCat), now sadly out of print. It’s a great micro-history of UK postboxes; I can’t recommend it highly enough, because the evolution and types of postboxes are much more interesting than one might imagine. While Wikipedia’s entry on pillar boxes is pretty interesting too, it lacks the charm and earnest interest of the book. Lo and behold, I was right that this was an anachronistic postbox! The box in the game is the 1872 Penfolds model where the aperture (slot to insert letters) was moved. Probably the most familiar and best loved of Victorian pillar boxes are those known as Penfolds, which were made between 1866 and 1879. They are named after their designed, the architect J.W. Penfold. […] The third type was brought about in 1872 by the complaint that letters could be trapped inside the top of the box, so the aperture was lowered to change places with the coat of arms below. Only four examples of this type still exist. Given their comparative rarity, however, I’m willing to forgive the Ubisoft team for their anachronistic postboxes. 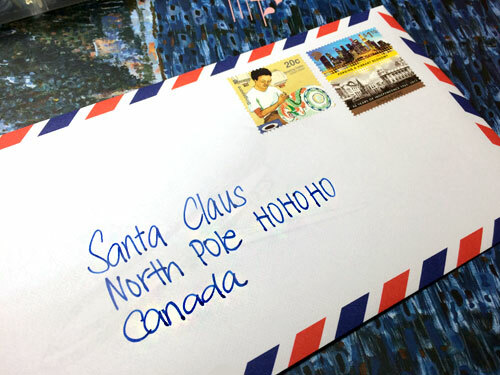 It’s November, so it’s time to send your letters to Santa! If you send a letter and include a return address, you’ll get a letter back! Remember to send early, especially if international mail takes a while. Mail between Singapore and Canada does take an awfully long time. You can find some fun templates on Canada Post’s website if you’d like somewhere to get started. 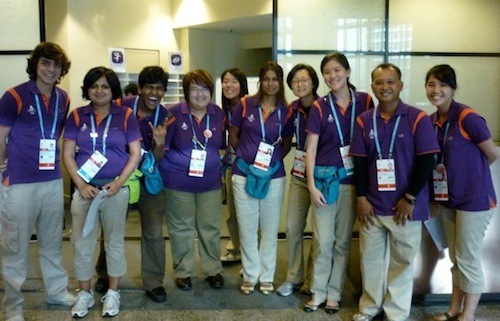 The proudest I’ve ever felt to be Singaporean was in 2010, when I was a volunteer for the first-ever Youth Olympic Games. For two weeks, 20,000 of us were deployed across the island at competition venues. We came from all over the world, although most of us were from Singapore. I met people from Russia, Greece, Kazakhstan, and so many other places. I was at a downtown convention centre, where six sports were competing. 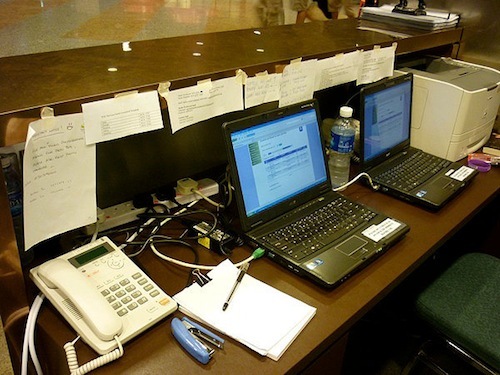 We manned the media helpdesk, helping foreign press and spectators with information and directions. It was pretty intense, because everything moved so fast. We had to deal with so many people, all with different needs. It was also one of the best times of my life. Over the years, I’ve become more aware of the flaws in the basic historic narrative we are taught, and which underscores much of our life. This has a lot to do with my growing understanding of social justice, privilege and racism, and how easily history can be shaped to suit our master’s needs depending on the balance of power. I’m nowhere near as critical as some of my learned friends, but I’m beginning to understand that not everything is as it seems, and how certain groups have been left behind at the expense of progress. That, as you can imagine, takes the shine off things. My family has benefitted immensely from our nation’s progress. We live comfortably, and I’ve never lacked anything important. I’ve had all the support I’ve needed, through school and beyond. We want for nothing and therefore can want for everything. I’ve grown up healthy, happy; and firmly middle-class or better. In more recent years, I’ve seen the worst side of people. I’ve read truly awful things that their writers truly believe. Real hate and deliberate ignorance is nauseating and deeply unsettling. I’ve had too many days where I hestitate before going out for fear that these people will find me the enemy. I’ve had too many nights where I want crawl out of my skin and soak in industrial-grade cleaner. The other day, I looked at the people who surround me. I’m surrounded by a diverse group of passionate people who love what they do. 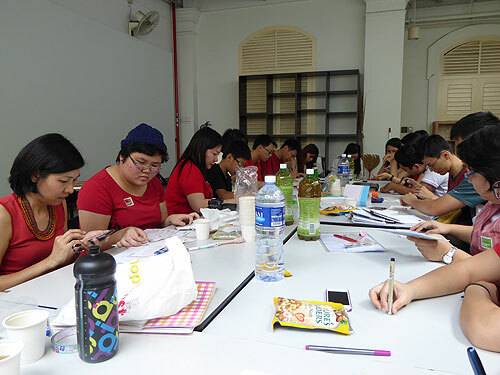 They draw their comics, they write their stories, they make their fan art, they rage about social justice – but all of this, they do out of love. They love, unironically, wholly and sincerely. They’re not without their flaws, but by and large, they’re wonderful. I am incredibly lucky to know them all. I am usually ambivalent about National Day. I don’t like the chest-thumping declarations, the pats on the back, the rah-rah about the oversimplified story of growing from a fishing village to First World country. Suddenly we’re so proud to be Singaporean when the rest of the year we complain? I’m still ambivalent. I’m not nearly as patriotic as I should be, particularly as it’s SG50 and all. Don’t get me wrong! I’m pleased. Happy, even. As a nation, we’ve overcome some pretty rough odds and done really well. I suppose what I’m trying to say is: We’ve done well these 50 years. For the next 50, it’s time for us to do better. And we can, even though self-realisation can be a painful and upsetting process. We’ve got a long ways to go before we’re a truly equal, regardless of our background. I’m waiting for the day where I can feel the same way I did on the day we closed the Youth Olympic Games. There are days when I despair at the state of affairs. But then I look at the people around me. They who love fiercely; who are passionate; who are, in their own ways, trying to change things. And I think we can do it. It’ll take us a while, but hey, we have another firty years before SG100, right? 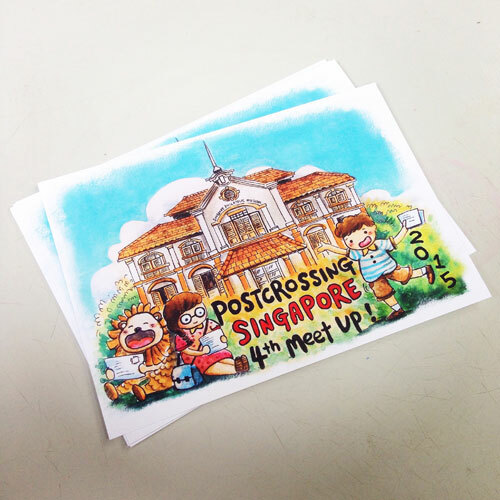 The annual Singapore Postcrossing meetup is always in January, and this year was no exception! 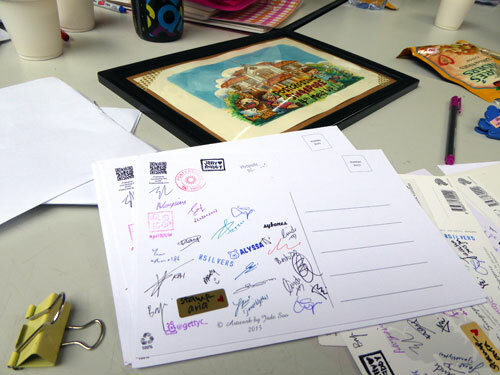 This year was a little more special, because we were at the Singapore Philatelic Museum! It was a very hot Sunday when 28 of us gathered at the Philatelic Museum, a charming museum in the heart of our downtown area. It was a pretty full house because their courtyard is small — it is a very small museum, after all. But it’s good to see so many familiar faces and new ones too! I like that it featured the Philatelic Museum! I really like it, because sometimes I think we focus too much on how *~modern~* and high tech Singapore is. We forget that old things can be good, too. Now with enough space for everyone to sign! I sent most of mine, and I’m glad I chose the recent tourism stamp issue. It’s one of my favourites because it’s very colourful and quite fun. 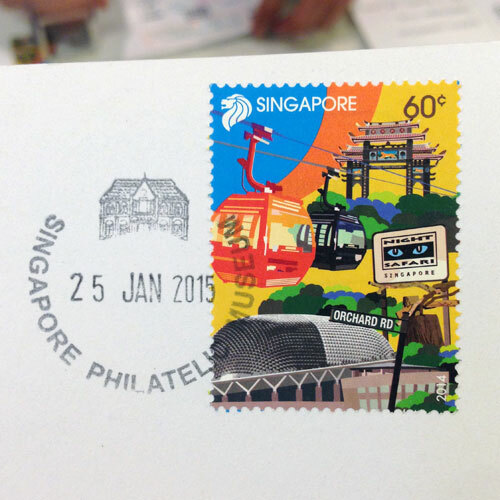 It goes well with the Philatelic Museum’s special postmark, too! 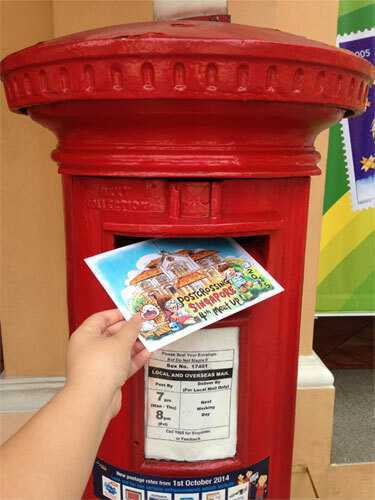 And then it was off to post it at what I reckon is the coolest postbox in Singapore: the red one, directly outside. The red pillar box is the last working red postbox in Singapore, cos we used to be a British colony. Our current postboxes are white with blue stripes. 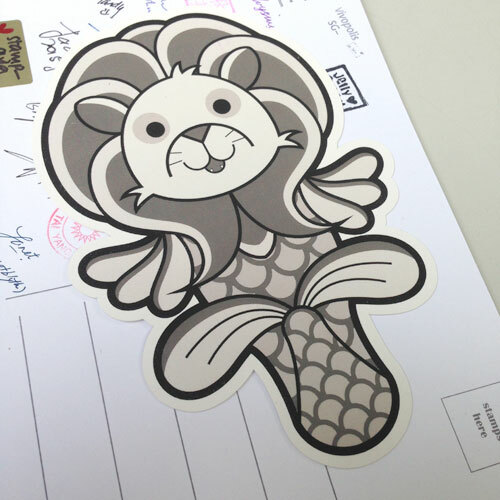 It’s off to a lucky Postcrosser! I had a great time talking to other postal people about postmarks, stamps and postcards. Can’t wait for the next one. 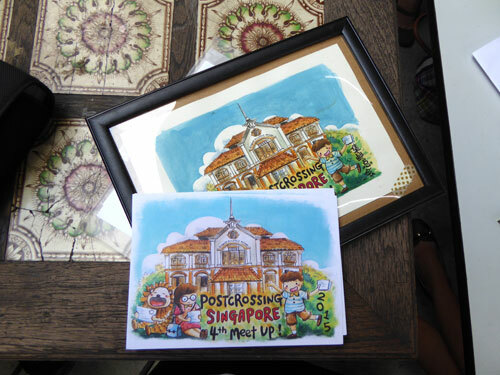 Major thanks to our long-suffering organiser sybones and our postcard designer jadesoo, and everyone else who made the Postcrossing meetup possible!